Welcome to the 3rd Episode of In Quest of My Oasis at Inspirations and Creative Thoughts, a series where we aspire to share dialogues with seekers & lovers of Sufi path. The Mystic Master Prophet Muhammad, may holy benedictions rise to his noble station, said, "at-turuqu ila 'Llahi ka-nufusi bani Adam", 'the ways to God are as numerous as the human souls'. The Quran states in verse 2:148, "And for everyone there is a direction towards which one turn." The Series God willing, will be tracing such unique, inspiring individual journey to the Goal. Here we wish to engage with contemporary seekers who are drawn to that Quest, whom we hope to know, connect and share their beautiful journey in the spirit of what sufis call Sohbet. The 3rd Episode of In Quest of My Oasis Series is blessed by the presence of life long interfaith activist and servant of One, Sister Noor-Malika Chishti (formerly known as Waliya Inayat Perkins), may God accept her service and illuminate her path. I was very blessed and fortunate to meet and spend some time with Sister Noor-Malika when I met her in Los Angeles. She surprised me in earlier correspondence by sharing her familiarity with my site. Brief but closely seeing her loving dedication and service to interfaith work, inter-tariqa work and selfless reachout to anyone who come across her path remains for me as a beautiful living inspiration! This interview even though taken across space (over email), trace back memory of meeting her first time near University of California, Los Angeles. While sharing our evening meal, I listened to her remarkable dream which reminded me of the Prophetic saying, "Nothing is left of Prophethood except glad tidings and such glad tidings are true dreams or visions." Sister Noor-Malika currently resides at Ojai, California, actively offering sufi gatherings, interfaith work and delightfully surrounded by her favorite flowers, matilija poppies. I hope and pray that you will enjoy and benefit from this sohbet (sufi chat, where companionship, knowledge and love comes together). Sadiq: I remember the first time we met at an Arab restaurant near UCLA, Los Angeles when you shared about the dream of Hazrat Inayat Khan, which was your first beckoning and Fatiha (opening) to the Sufi path. Would you please share that special dream with the readers? Noor-Malika: I was 22-years old and had never heard of Sufism, and didn’t know anything about Islam, either. In a dream I saw the image of an East Indian looking man in a long robe. He was standing before a white picket fence at a gate, peering into my eyes. The gate had an arch over it. There were yellow roses everywhere. A few weeks later some friends - one of them the wonderful late Nubian Oud player, Hamza El Din, may Allah grant him mercy, went to a weekend workshop and bought a book for me on the education of children. 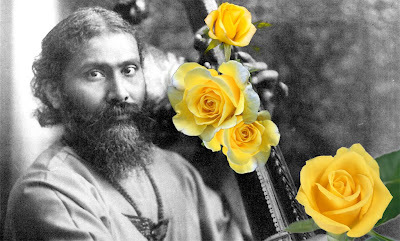 When I opened the book, there was a photo of the man in my dream; it was Pir-o-Murshid Hazrat Inayat Khan. I took the book everywhere with me and found the teachings to resonate within. A few weeks later, I was at a restaurant in Los Angeles and a woman came walking across the street carrying her three-month old baby. We ended up talking with each other and I held her daughter while she ate. 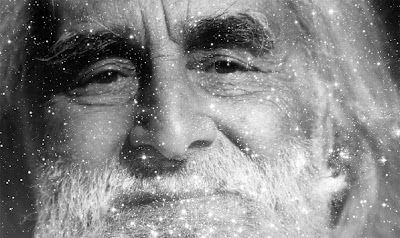 She noted the book I was reading and offered, “my teacher’s father wrote that book.” A short time afterwards, the teacher, Pir Vilayat Inayat Khan came to Los Angeles and I found myself “at home” with him. I began the process to take initiation, or, bayat, with him. That was in 1972. Sadiq: It's so interesting and a beautiful gift from the realm of Unknown that you met three great Sufi masters from three successive generations. First being Hazrat Inayat Khan, the grandfather who brought Sufi message to the west, whom you didn't meet physically but only in a sacred vision. Then in your quest you took hand with his son Pir Vilayat Inayat-Khan and during that time you also did babysitting of Vilayat Inayat-Khan's son, Zia Inayat-Khan, who now is the successor of this great lineage. Looking back to such illustrious companionship, would you say that it’s Pir-o-Murshid Inayat-Khan who even being invisible had the greatest impact on your spiritual journey? Noor-Malika: At first, my response was yes, Murshid has had the biggest impact on me. But without Pir Vilayat all those years and now, Pir Zia, I would not have had the living example so necessary for most of us. In my dream of Murshid, he glanced in my eyes. I have had this experience with both Pir Vilayat and Pir Zia; it is a glance that is living. I would also include Imam Salim Chishti, my Guide in the Sufi Order. The living link is essential, but ultimately, we must remember this is about effacing through the Chain into the One. I have seen both Pir Vilayat and Pir Zia refuse those who wanted to touch their feet. Pir Zia even asks us to NOT stand when he enters the room. I see this as a protection for the Pir and for the mureed. Sadiq: You are very active in interfaith work for some time now. What drives and inspires you most to this work? Our local Sufi Center, under the guidance of Murshida Qahira Qalbi, offered one of the first Universal Worship Services for children in the early 1970s. 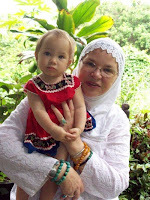 Since I had not converted to Islam at the time and was not actively following the religion of my birth, I told my children, Illah and Hashim, stories of all the religions and of their prophets and teachers and told them when they were older they would find the way that suited them best. This was a bit difficult for my children when they were in grammar school. Their friends were usually either Jewish or Christian and they wanted to be “something”. By their 20s both of my children had chosen paths, one in the Native American Church and the other, a Taoist. My children’s father and his wife are Buddhist. We are an interfaith family. So, ending up so involved in interfaith work was kismet (divinely appointed destiny). I began by joining the Culver City Area Interfaith Alliance which was a wonderful training ground for me. Next, I joined a dialogue group for Jewish and Muslim women called West Los Angeles Cousins. I have met with this amazing circle of women for over 6 years. I recently moved out of Los Angeles 75 miles and decided I had to make the drive once a month to stay involved. We have shared personal stories as well as looked into our scriptures and customs. What we have found is how much we love each other and that causes us to be not so quick to judge and feel offense at our differences. A few days into the 2006 war between Israel and Lebanon our Cousins had one of our regular meetings scheduled. We knew there was a white elephant in the room and chose to address it directly. We spoke with caring about the different women who have family or friends in the region. For those who have lived there. For the sisters in our circle who have lived in war. We ended that evening by reading the closing chapter of a book (The Tent of Abraham: Stories of Hope and Peace for Jews, Christians, and Muslims by Joan Chittister, Rabbi Arthur Waskow and Murshid Saadi Shakur Chishti) I had just finished which dealt with a wonderful midrash (Jewish teaching tale; method of biblical exegesis) from Rabbi Phyllis Berman on Sarah and Hagar (Video of Rabbi P Berman on Sarah and Hagar). Our Cousins had been delving into what we could learn of their stories and how their stories applied to us today. I am deeply grateful for the healing this midrash gave to our Cousins that night. When the night was over we knew we had experienced something good and rare. Our Cousins group had a second opportunity to deal with war in the winter of 2008 when Israel and Gaza went at it. Several of our Jewish and Muslim Cousins joined me at the Federal Building in West Los Angeles. I purposely chose a spot down the street from where I knew a Jewish protest was taking place. Curious protesters came to look at my sign: Let me be a servant of Thy peace. I greeted each person with peace and told them I was there to help build bridges. Everyone responded in a very positive way. When my friends joined me we found it a bit of a challenge as a car of young Jewish students drove around and around and taunted us with hateful remarks; we maintained our attunement of peace. Three Jewish high school students (boys) approached me and asked if they could stand with us; they liked our approach better. We shared our signs with them and discovered as the car of young students came around again, they knew the boys standing with us; they were very confused by this! The boys asked me to help them begin an interfaith group in their high school. This is how the work is spread. Sadiq: While many of the students of Vilayat Khan opted for an approach to Sufism which bypass Islam whereas you embraced both the sharia (Islamic way and laws) and haqiqa (inner reality) with Islam. In an age of confusion where Zen is taught without Buddhism, where Yoga is taught without Hinduism and Vedanta - many just see the peak of the mountain in Sufism and forget about the foundation which is Islam. What really convinced your own journey of Tour de Force into Islam and Sufism? Dr. Khan’s advice has been validated in my own experience. After I said shahada and began to study the Qur’an, I had “aha” moments as I read what I felt to be the source of Murshid’s teachings; I continue to have these insights. I highly recommend Dr. Khan’s book, “Reflections on the Qur'an”. Sadiq: In recent time your present shaykh gave you a new name, Noor-Malika, which took over your earlier name, Waliya Inayat. What is the significance of a new name in Sufi Path? Noor-Malika: I believe the tradition began with the Prophet, peace upon him. When someone said shahada (witnessing the truth) he would change their first name if it had a pagan association or a negative meaning. He told people to keep their surname so as not to alienate their family. Before my teacher changed my name I had told him I didn’t recognize myself; I saw myself dealing with situations in new ways. This feedback validated his intuition to change my name, and the deed was done. It turned out this name change for me was so right on. I first thought, not at this age! I made the shift in stages and soon found a desire to jump right in with Noor-Malika. I think of the name given to a mureed as an invocation of what to call forth within oneself in order to be more of what is latent in one’s being. Sadiq: A Murshid, a Sufi Guide sacrifice his own life for the sake of his disciples, taking their burdens, complaints, trials upon himself and at the same time giving the service of guidance, blessings and protection to the journeys of his students. What is the best way to pay our debt towards him if there is any, to the Murshid? Noor-Malika: Murshid sacrificed much to be a servant of the One. He was the musician of the day in India and could have had a life of luxury and fame. He came to realize he had to put down his music and lecture to the European and American audiences, for whom Murshid put complex ideas into succinct and beautiful language. Remembering that, insh’allah, Fana-fi-al Murshid is a step leading to Fana-fi-Allah, I would suggest the debt is to Allah ta’ala alone. Sadiq: Just recently you went to Parliament of World Religions in Australia representing USA. This parliament has been graced by so many spiritual teacher of world stature including that of Swami Vivekananda, disciple of Sri Sri Ramakrishna Paramhansa. How is the association of Sufi teachers in it from past to present? Additionally, at the 2004 Parliament of World Religions in Barcelona, Pir Vilayat was posthumously awarded the Hollister Prize for his work in creating interfaith understanding. I am sure there has been a Sufi presence at the Parliaments in South Africa and Barcelona, but do not have information on that. At the recent Parliament in Melbourne there were many Islamic presenters who practice tasawwuf, but their presenting credentials were as Muslims scholars, not Sufis, for the most part. One who was there as a “Sufi” was Sheikh Abdul Aziz Bukhari, a co-founder of Jerusalem Peacemakers and head of the Naqshabandi Sufi order in Jerusalem. Sheikh Bukhari is a descendant of Sahih Bukhari who collected hadith of the Prophet, peace upon him. The Naqshbandi Sufi Order of Australia offered a sema, or, whirling prayer dance, during one of the evening plenary sessions. Imam Abdul Malik Mujahid from Chicago announced to us that he had accepted the position of incoming Chair of the Board of Trustees for the Parliament, effective January 1, 2010. Insh’allah, this will attract more Muslims into this work. Attending the Parliament in Melbourne was a life-changing experience for me in so many ways. This was the first time I traveled out of the United States in my 60-some years. One of my biggest surprises was how much the Parliament brought me more into Islam. There was something wonderful about being with so many Muslims doing this work, and many were people whose work I have followed and admired, such as Dr. Hamid Hai, Imam Feisal Rauf, Dr. Tariq Ramadan, and Sheik Abdul Aziz Bukhari from Jerusalem. It was also great to find out about the work of other Muslims, such as Rachel Woodlock and Susan Carland from Australia and Zain Bhikha from South Africa, whom you may have listened to on YouTube. One of the three workshop in which I presented was with two friends from the Southern California Committee for a Parliament of the World's Religions; I serve as Co-Vice Chair of SCCPWR. Anthony Manousos is a “Friend”, and Ruth Sharone is Jewish. Our workshop title was, “Compassionate Listening.” The portion I presented dealt with what happens in interfaith situations when things go sour. I gave several examples of how shadow issues can arise, and ended by inviting my friend Ruth to come and join me. I then explained that Ruth and I had a personal experience of conflict happen between us. We asked our dear friend, Thomas, who serves as an interfaith chaplain, to help us process our experience. The fact that Ruth and I came through this stronger than ever speaks to the personal transformation that can be accomplished while doing this work. Many folks came up to me and Ruth in Melbourne and expressed their gratitude for what we modeled. So often our religious teachings ask us to overlook the fault of another, but this does not mean we do not deal with life situations. In one of the workshops I attended at the Parliament on Appreciative Inquiry, the last question for our group asked how we had dealt with a situation of bigotry in our life, or, an issue of bigotry we still deal with. A Zoroastrian brother who had lived in Egypt shared his upset over how he perceives Islam to be a violent religion, giving the usual example of suicide bombers. When he finished speaking I shared ayats on committing suicide [4:29] and taking the life of another [5:32]. The brother thanked me and when the workshop was over he asked to speak with me. He told me he has shared this same story with two other Muslims who did not counter his statements with Qur’an; the man cried as he expressed his gratitude for clearing up this misimpression of Islam. The same situation happened with a Hindu woman I sat next to during one break. In the end, she brought over her husband to take a picture of the two of us because she was so happy to clear up her confusion of Islam in these matters. A final story perfectly illustrates my trip to Melbourne. I had an over hour-long bus ride into and back from the city each day. One day I began speaking with an Italian-Australian woman in her mid-70s sitting next to me. Her sister, who was not conversant in English, sat across from us. As we wound our way towards City Center, we spoke of many things. I asked if she had ever spoken to a Muslim before and she said, no, she hadn’t. We rode the bus to the end of the line and found we were walking in the same direction, so the three of us continued on together. When we reached the place we were parting ways I asked if I could hug. As we stood on the street corner, we both cried and then I felt a tap on my shoulder. The sister was saying, “me, hug, too,” and we expanded our hug to include her. I asked them to tell their friends they have learned Islam is a religion of peace and we parted ways. Two days later as I was riding the bus back to my homestay, I felt someone tapping my hands; there before me were the two Italian sisters, each beaming at seeing me again. Sadiq: What is the meaning of this human existence we call 'life' to a Sufi? "Whoever knows [her]self, knows [her] Lord"